This post can teach you tips for dirt bike lubrication and maintenance as well as dirt bike safety tips and precautions. Riding your dirt bike can be an incredibly fun and thrilling experience but if you aren´t careful it could also turn into a not so pleasant ride. That is why it is very important to carefully consider the care you provide for your bike, the conditions you ride in and the precautions you take. All of these factors are what can make your riding experience an exciting adventure or an unpleasant experience. Dirt bikes are meant to hit the rough roads and hard trails and they are created for the muddy paths that you may encounter their structure and tires are designed to withstand those harsher conditions but the internal products that you use on your dirt bike can make all the difference in both performance and safety. As we have mentioned before, the engine in your dirt bike relies heavily on the oil for lubrication, heat protection, and even sludge prevention, this makes it imperative to use a quality lubricant that can best cover the demands of your dirt bike. Synthetic oil is the adequate choice of motor oil when it comes to dirt bikes because it allows it covers the engine against friction and other dangers, even when facing very extreme conditions and rough roads. 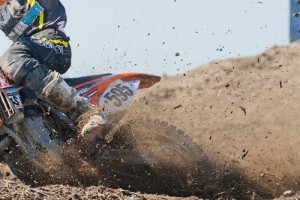 AMSOIL has formulated synthetic oils especially created for the demanding conditions that your dirt bike faces. They carry both four-stroke and two-stroke synthetic lubrication options to match your needs. Their 10W-40 Synthetic Dirt Bike Oil is recommended for popular Honda and Yamaha dirt bikes. For two-stroke dirt bikes you will find that the DOMINATOR® Synthetic 2-Stroke Racing Oil is the ideal lubricant. No matter what type of engine your dirt bike has AMSOIL will provide the perfect wear protection and utmost reliable lubricant for every occasion. Contact Mooresville Synthetic Oil directly and ensure the safety of your engine. Keeping your dirt bike in a good state and ensuring that you complete regular maintenance tasks such as changing the oil, cleaning the filters, checking the tires, and verifying that all is well with the battery, are all important tasks that need to be revised periodically. Other tasks that are also important is ensuring that the brakes are in good conditions and verifying that fluids are not leaking, that all electrical parts and wiring is in optimal shape and that nuts and bolts are properly tightened. Always verify vital components such as the brakes, the fluids, and the tires before heading out on your dirt bike. It can be easy to just get on your bike and head for the trails but it is important to take the right precautions to avoid a dangerous accident. Another important thing to keep in mind is that because your dirt bike is created for trails and dirt roads it is not a good idea to use it for regular paved streets as it can become a hazard in these conditions. In fact, unless you have a dual bike that is legally authorized to be used on both dirt roads and paved streets, you cannot legally ride a dirt bike on the street or highways. If it is absolutely necessary that you cross a road to get to a trail then do so with absolute precaution and avoid high speeds in those spots. It is always best to plan your long dirt bike trips and to go with a partner or to at least let a loved one know where you will be heading. If possible, always share with a trusted friend your trail plans and expectation time of return so that if there should be any problems they can be aware of your whereabouts. This is one of the best ways to ensure that if something goes wrong someone will be on the lookout for your arrival and can get help to you sooner in case you aren´t back when you should be. We know it isn´t always likely that something like this will happen but it is always best to be safe rather than sorry. Remember that your dirt bike is designed especially for tough conditions and great outdoor adventures and therefore needs a reliable lubricant to count on. At Mooresville Synthetic Oil you will find everything you need for your dirt bike´s synthetic oil change and other necessary maintenance tasks. Call (336) 247-0212 today and buy what you need for your dirt bike's care so that you can head out on your ride with the peace of mind you deserve.